Atlantic croaker is primarily caught recreationally, but a small commercial fishery exists. The landed croaker are sold locally and used as bait or as scrap fish. Landings have historically been highly variable, peaking at 1977/78 at 13,000 mt and dropping to 1,676 mt in 1991. Atlantic croaker is not exported outside the US. According to the most recent 2010 stock assessment, Atlantic croaker is not overfished, nor are they being overfished. Stock biomass has been increasing and catches have been decreasing, which suggest that the population is in good condition. There is an uncertain amount of croaker that are caught incidentally and as bycatch from shrimp fisheries. Atlantic croaker are caught using pound nets and beach seine nets which case minimal habitat damage however they do cause the bycatch of bottlenose dolphins. Bottlenose dolphins are a threatened species and are highly vulnerable to fishing mortality. Many bottlenose dolphin stocks are depleted. Beach seine nets (haul nets) are not known to cause bycatch. 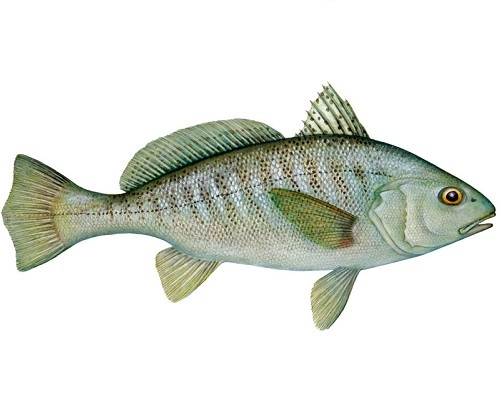 Atlantic croaker are managed under the Atlantic States Marine Fisheries Commission (ASMFC). There is very little observer coverage onboard Atlantic croaker vessels regulating bycatch, although gear restrictions and minimum size limits exist. Management appears to be moderately effective as the stock is currently healthy, and is regularly monitored via stock assessments. Croaker is caught as part of a mixed fishery, together with bluefish and menhaden. Bluefish abundances are healthy. Menhaden which are a forage fish, critical to the ecosystem, are overfished and many uncertainties exist regarding their abundance. Loggerhead turtles, Atlantic sturgeon and bottlenose dolphins are caught as bycatch. The use of bottom gillnets are not known to cause large amounts of habitat damage since they are immobile structures resting on the ocean floor. Bottom trawls cause more damage, as they are dragged over the substrate, causing destruction to physical structures and possible injury and mortality to other organisms. While croaker and bluefish do not play critical ecosystem roles, menhaden which are caught together in the same fishery, do play a critical role. They feed on large zooplankton which larger fish cannot filter, and thus serve as a link between these large zooplankton and the numerous predator species which prey on the menhaden themselves. Menhaden are currently not managed as part of the croaker fishery, which is of concern. Atlantic croaker is managed under the Atlantic States Marine Fisheries Commission (ASMFC). There is very little observer coverage onboard Atlantic croaker vessels regulating bycatch, although gear restrictions and minimum size limits exist. Management appears to be moderately effective as the stock is currently healthy, and is regularly monitored via stock assessments.